ACF by Nameeks ACF C03-GW Cubical 30-in. Single Bathroom Vanity Set. Modern wall-mounted vanity set. Engineered wood cabinet with metal accents. Glossy White finish with chromed accents. 2 soft-close vanity doors. Choice of Faucet drill holes. Rectangular white ceramic sink bowl. Includes vanity, sink, mirror, and light. Faucet not included. Clean and stylish, the ACF by Nameeks ACF C03-GW Cubical 30-in. Single Bathroom Vanity Set - Glossy White adds contemporary luxury to your bathroom. This four-piece set includes a two-door vanity cabinet, fitted ceramic sink, vanity mirror, and light. Its brilliant Glossy White finish and chromed accents lend a polished look. The vanity is wall-mounted so it seems to float, which gives the illusion of more space. Bold cabinet pulls open the soft-close doors to reveal open storage space inside. The mirror and its overhead light complete this set.Component Dimensions:Vanity dimensions: 30.1W x 17.5D x 21.8H in.Mirror dimensions: 28.3W x 27.6H in.About NameeksFounded with the simple belief that the bath is the defining room of a household, Nameeks strives to design a bath that shines with unique and creative qualities. Distributing only the finest European bathroom fixtures, Nameeks is a leading designer, developer, and marketer of innovative home products. In cooperation with top European manufacturers, their choice of designs has become extremely diversified. Their experience in the plumbing industry spans 30 years, and is now distributing their products throughout the world today. Dedicated to providing new trends and innovative bathroom products they offer their customers with long-term value in every product they purchase. In search of excellence, Nameeks will always be interested in two things: the quality of each product and the service provided to each customer. ACF by Nameeks ACF NY09-MC New York 24-in. Single Bathroom Vanity Set. Modern wall-mounted vanity set. Engineered wood cabinet with metal pulls. Matt Canapa finish with polished chromed accents. 2 soft-close cabinet doors. Choice of faucet drill holes. Rectangular white ceramic sink bowl. 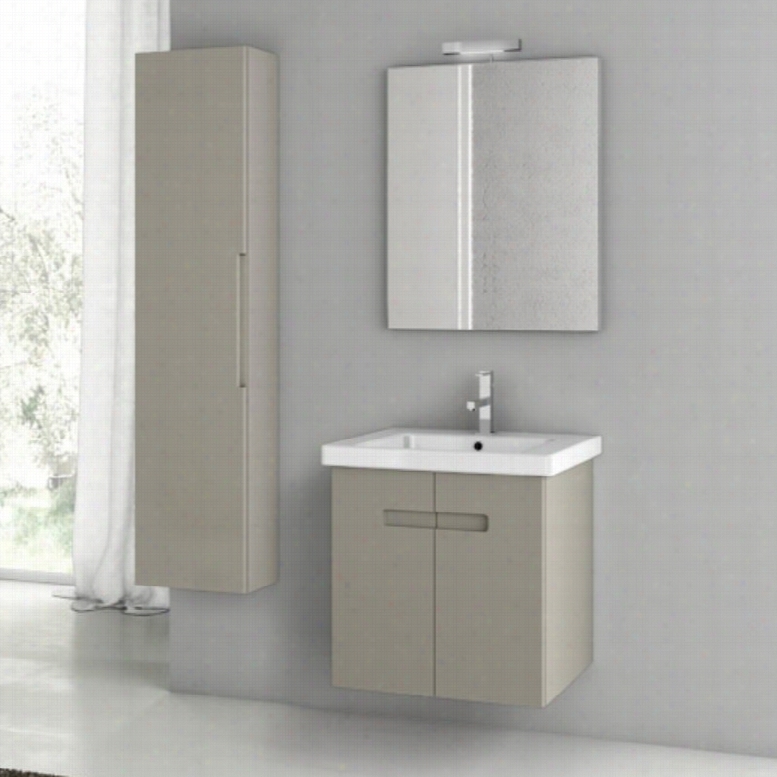 Includes wall-mounted vanity, fitted white ceramic sink, Mirror, vanity light, tall storage cabinet, and towel rail. Faucet not included. You can put a whole new face on your bath with the ACF by Nameeks ACF NY09-MC New York 24-in. Single Bathroom Vanity Set - matt canapa just a few clicks away. This six-piece set includes a vanity, fitted white ceramic sink, mirror, vanity light, tall storage cabinet, and towel rail. Just choose your ideal faucet to round out the set. For a unique floating effect, the vanity mounts above your floor, securely to the wall. The chrome of the hardware plays gracefully off the matt canapa finish of the vanity.Component Dimensions:Vanity dimensions: 24.4W x 18.9D x 21.8H in.Mirror dimensions: 28.3W x 23.6H in.Fitted rectangular sink dimensions: 23.6W x 17.7D in.About NameeksFounded with the simple belief that the bath is the defining room of a household, Nameeks strives to design a bath that shines with unique and creative qualities. Distributing only the finest European bathroom fixtures, Nameeks is a leading designer, developer, and marketer of innovative home products. In cooperation with top European manufacturers, their choice of designs has become extremely diversified. Their experience in the plumbing industry spans 30 years, and is now distributing their products throughout the world today. Dedicated to providing new trends and innovative bathroom products they offer their customers with long-term value in every product they purchase. In search of excellence, Nameeks will always be interested in two things: the quality of each product and the service provided to each customer. ACF by Nameeks ACF NY01-MC New York 24-in. Single Bathroom Vanity Set. Modern wall-mounted vanity set. Engineered wood cabinet with metal feet and pulls. Matt Canapa finish with polished chromed accents. 2 soft-close cabinet doors. Choice of faucet drill holes. Rectangular white ceramic sink bowl. Includes vanity, sink, mirror, vanity light. Faucet not included. Let the ACF by Nameeks ACF NY01-MC New York 24-in. Single Bathroom Vanity Set - Matt Canapa add its chic style to your bathroom for years to come. This alluring four-piece set is the whole package with the vanity, sink, mirror, and vanity light all included. Just make your choice of faucet. It floats elegantly above your bathroom floor thanks to a sturdy wall-mounted design. You'll love how the chrome hardware plays off the matt canapa finish of the cabinet.Component Dimensions:Vanity dimensions: 24.4W x 17.7D x 21.8H in.Mirror dimensions: 23.6H x 28.3W in.Fitted rectangular sink dimensions: 23.6W x 17.7D in.About NameeksFounded with the simple belief that the bath is the defining room of a Household, Nameeks strives to design a bath that shines with unique and creative qualities. Distributing only the finest European bathroom fixtures, Nameeks is a leading designer, developer, and marketer of innovative home products. In cooperation with top European manufacturers, their choice of designs has become extremely diversified. Their experience in the plumbing industry spans 30 years, and is now distributing their products throughout the world today. Dedicated to providing new trends and innovative bathroom products they offer their customers with long-term value in every product they purchase. In search of excellence, Nameeks will always be interested in two things: the quality of each product and the service provided to each customer. ACF by Nameeks ACF CP06-W City Play 22-in. Single Bathroom Vanity Set. Modern wall-mounted vanity set. Engineered wood cabinets with metal pulls. Wenge cabinet finish and polished chromed accents. Soft-close cabinet doors. Choice of faucet drill holes. Rectangular white ceramic sink bowl. Includes vanity, sink, short storage cabinet, mirror, light, towel bar. Faucet not included. The ACF by Nameeks ACF CP06-W City Play 22-in. Single Bathroom Vanity Set - Wenge is a contemporary way to make the most of your space. This six-piece set includes a two-door vanity cabinet with fitted ceramic sink and towel bar. Above is a short storage cabinet, mirror, and vanity light. Faucet sold separately. The vanity and short cabinet have a sophisticated dark Wenge finish. Chromed pulls and towel bar add polish. 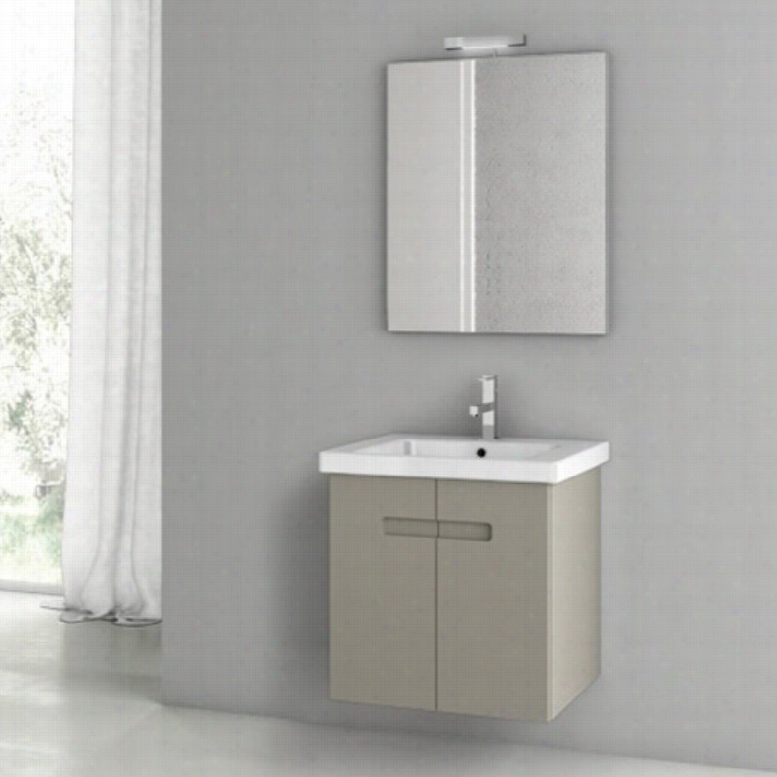 The vanity and short cabinet are wall-mounted for stability and a free-floating aesthetic. Thick pulls open soft-close cabinet doors to reveal ample storage space within both pieces. 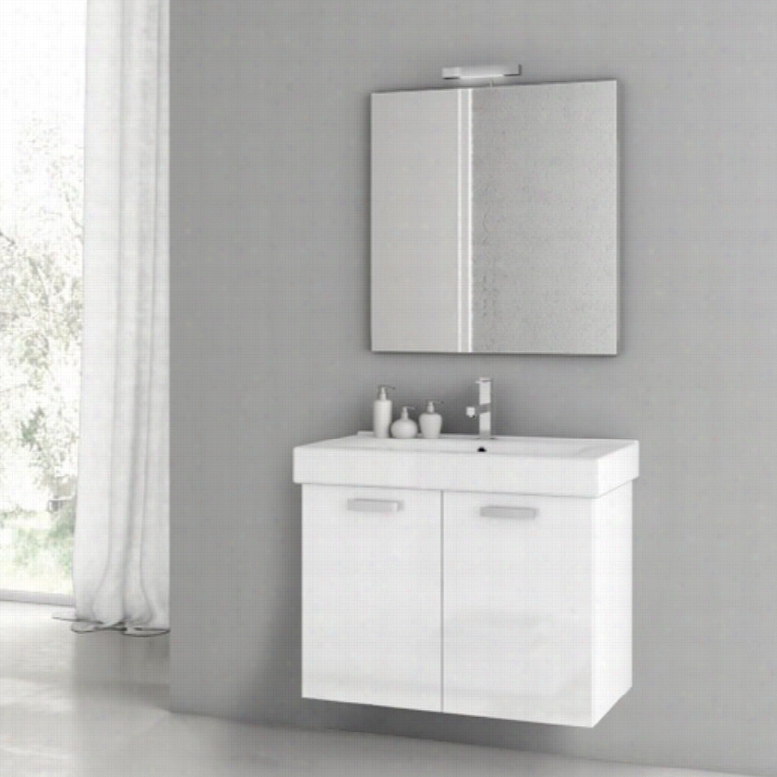 The mirror has a light that illuminates brilliantly.Component Dimensions:Vanity dimensions: 22W x 16.9D x 21.8H in.Short storage cabinet: 13.8W x 8.2D x 28.3H in.Fitted sink dimensions: 23.6W x 17.7D in.Mirror dimensions: 23.6W x 28.3H in.About NameeksFounded with the simple belief that the bath is the defining room of a household, Nameeks strives to design a bath that shines with unique and creative qualities. Distributing only the finest European bathroom fixtures, Nameeks is a leading designer, developer, and marketer of innovative home products. In cooperation with top European manufacturers, their choice of designs has become extremely diversified. Their experience in the plumbing industry spans 30 years, and is now distributing their products throughout the world today. Dedicated to providing new trends and innovative bathroom products they offer their customers with long-term value in every product they purchase. In search of excellence, Nameeks will always be interested in two things: the quality of each product and the service provided to each customer. Cole & Co 11-22-275542-65 - Briggs Sink Chest Bathroom Vanity. ACF by Nameeks ACF CP01-LC City Play 22-in. Single Bathroom Vanity Set. Modern wall-mounted vanity set. Engineered wood Cabinet with metal pulls. Larch Canapa finish with polished chromed accents. 2 soft-close cabinet doors. Choice of faucet drill holes. Rectangular white ceramic sink bowl. Includes vanity, sink, mirror, and light. Faucet not included. The modern design of the ACF by Nameeks ACF CP01-LC City Play 22-in. Single Bathroom Vanity Set - Larch Canapa adds a stylish simplicity to your bathroom d&eacute;cor. This four-piece set includes a two-door vanity cabinet, fitted ceramic sink, vanity mirror, and light. The vanity is wall-mounted for enduring stability. Its Larch Canapa finish is a welcoming accent to your bathroom surroundings. Chromed accents add a clean, polished look. Rectangular pulls open the soft-close cabinet doors. Completing the modern appearance of this set is the gleaming mirror and light.Component Dimensions:Vanity dimensions: 22W x 16.9D x 21.8H in.Mirror dimensions: 28.3W x 23.6H in.Fitted rectangular sink dimensions: 33.9W x 14.6D in.About NameeksFounded with the simple belief that the bath is the defining room of a household, Nameeks strives to design a bath that shines with unique and creative qualities. Distributing only the finest European bathroom fixtures, Nameeks is a leading designer, developer, and marketer of innovative home products. In cooperation with top European manufacturers, their choice of designs has become extremely diversified. Their experience in the plumbing industry spans 30 years, and is now distributing their products throughout the world today. Dedicated to providing new trends and innovative bathroom products they offer their customers with long-term value in every product they purchase. In search of excellence, Nameeks will always be interested in two things: the quality of each product and the service provided to each customer. ACF by Nameeks ACF ANS01-GW New Space 23-in. Single Bathroom Vanity Set. Modern wall-mounted vanity set. Engineered wood cabinet with metal feet and pulls. Glossy White finish with polished chromed accents. 1 soft-close cabinet door. Choice of faucet drill holes. Rectangular white ceramic sink bowl. Includes vanity, sink, mirror, vanity light, 4 chrome feet. Faucet not included. The beauty is in the simplicity of the ACF by Nameeks ACF ANS01-GW New Space 23-in. Single Bathroom Vanity Set - Glossy White. This striking five-piece set comes complete with vanity, sink, mirror, vanity light, and four chrome feet. Mounting sturdily to your wall, this vanity gives you the choice to add the chrome legs or not. The eye-catching Glossy White finish plays perfectly off the chrome hardware. 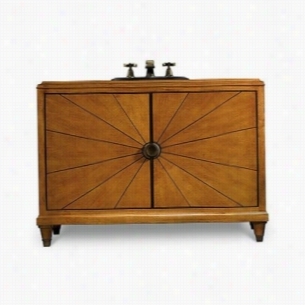 This set even offers ample storage in the vanity with three spacious cabinets. Just make your choice of faucet.Component Dimensions:Vanity dimensions: 23.4W x 17.7D x 21.8H in.Mirror dimensions: 28.3W x 23.6H in.Fitted rectangular sink dimensions: 23.6W x 17.7D in.About NameeksFounded with the simple belief that the bath is the defining room of a household, Nameeks strives to design a bath that shines with unique and creative qualities. Distributing only the finest European bathroom fixtures, Nameeks is a leading designer, developer, and marketer of innovative home Products. In cooperation with top European manufacturers, their choice of designs has become extremely diversified. Their experience in the plumbing industry spans 30 years, and is now distributing their products throughout the world today. Dedicated to providing new trends and innovative bathroom products they offer their customers with long-term value in every product they purchase. In search of excellence, Nameeks will always be interested in two things: the quality of each product and the service provided to each customer. ACF by Nameeks ACF CP05-W City Play 22-in. Single Bathroom Vanity Set. Modern wall-mounted vanity set. Engineered wood cabinet with metal pulls. Wenge cabinet finish and polished chromed accents. 2 soft-close cabinet doors. Choice of Faucet drill holes. Rectangular white ceramic sink bowl. Includes vanity, sink, medicine cabinet, light, towel bar. Faucet not included. The ACF by Nameeks ACF CP05-W City Play 22-in. 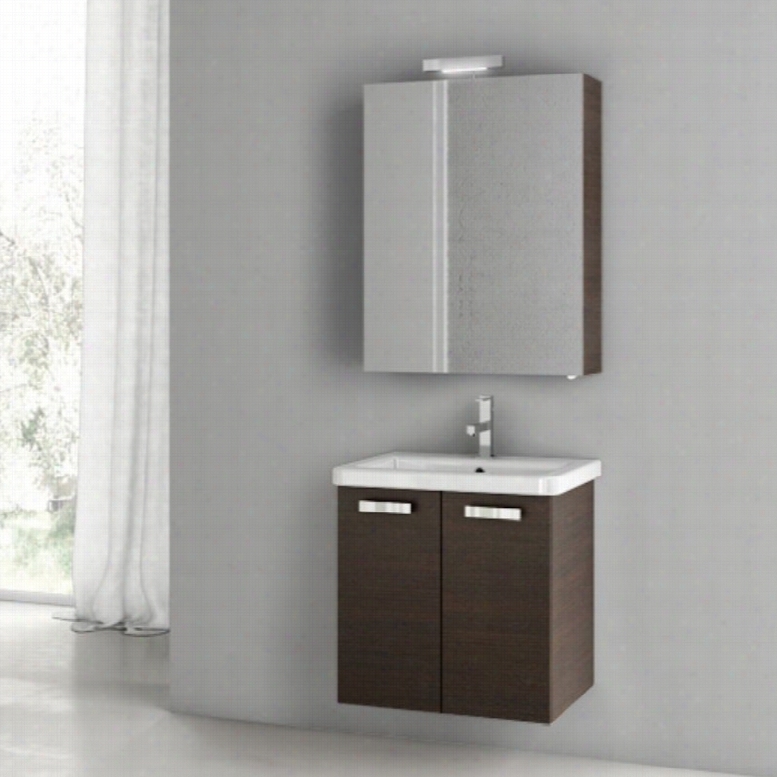 Single Bathroom Vanity Set - Wenge has clean, contemporary lines perfect for your bath. This five-piece set includes a two-door vanity cabinet, fitted ceramic sink, towel bar, medicine cabinet, and vanity light. Faucet sold separately. 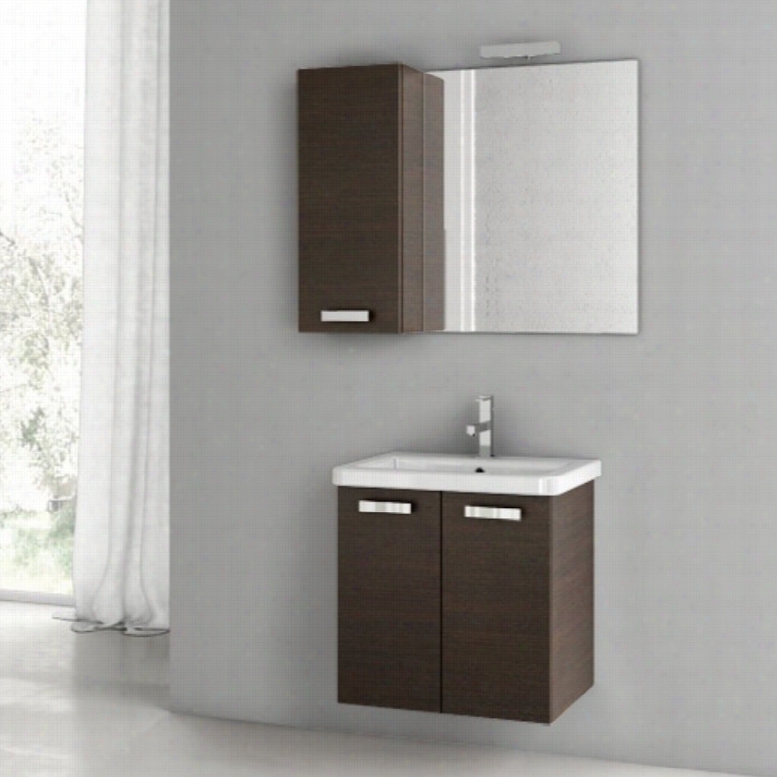 The vanity and medicine cabinet have a deep Wenge finish that adds modern sophistication. Chromed pulls and towel bar add polish. The vanity is wall-mounted for stability and a free-floating aesthetic. Thick pulls open the two soft-close cabinet doors to reveal ample storage space within. 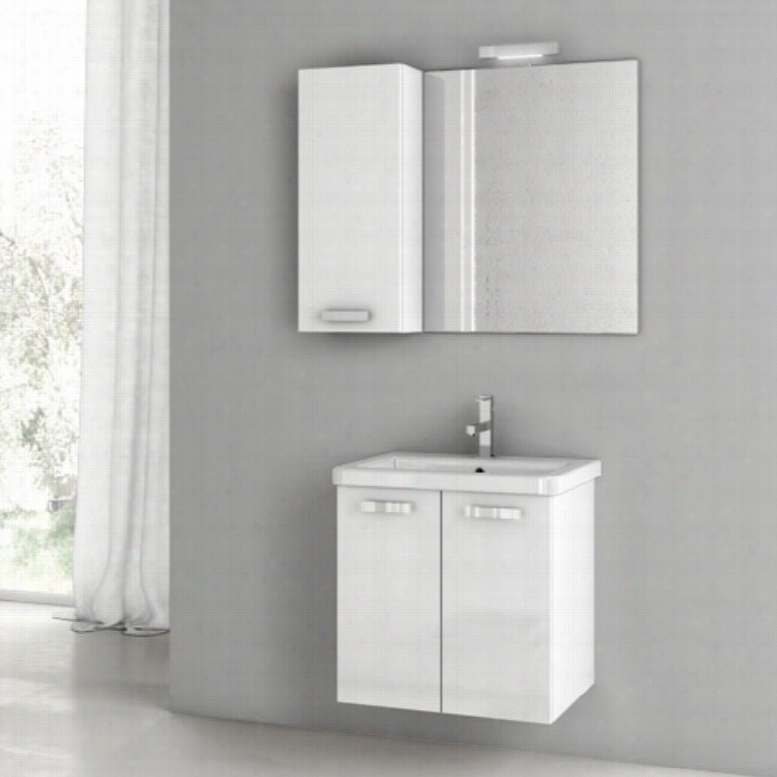 The medicine cabinet has a light that illuminates brilliantly.Component Dimensions:Vanity dimensions: 22W x 16.9D x 21.8H in.Medicine cabinet dimensions: 23.6W x 8.2D x 30.3H in.Fitted sink dimensions: 23.6W x 17.7D in.About NameeksFounded with the simple belief that the bath is the defining room of a household, Nameeks strives to design a bath that shines with unique and creative qualities. Distributing only the finest European bathroom fixtures, Nameeks is a leading designer, developer, and marketer of innovative home products. In cooperation with top European manufacturers, their choice of designs has become extremely diversified. Their experience in the plumbing industry spans 30 years, and is now distributing their products throughout the world today. Dedicated to providing new trends and innovative bathroom products they offer their customers with long-term value in every product they purchase. In search of excellence, Nameeks will always be interested in two things: the quality of each product and the service provided to each customer. 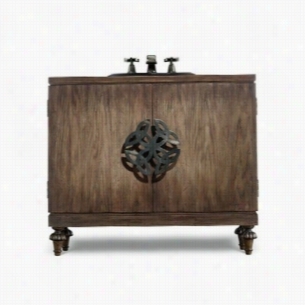 Cole & Co 11-22-275549-67 - Asbury Hall Chest Bathroom Vanity. ACF by Nameeks ACF CP06-GW City Play 22-in. Single Bathroom Vanity Set. Modern wall-mounted vanity set. Engineered wood cabinets with metal pulls. Glossy White cabinet finish. Polished chromed cabinet pulls. Soft-close cabinet doors. Choice of faucet drill holes. Rectangular white ceramic sink bowl. Includes vanity, sink, Short storage cabinet, mirror, light, and towel bar. Faucet not included. The ACF by Nameeks ACF CP06-GW City Play 22-in. Single Bathroom Vanity Set - Glossy White is graced with a brilliant Glossy White finish that inspires a contemporary spa vibe. This six-piece set includes a two-door vanity cabinet with fitted ceramic sink and towel bar. Above is a short storage cabinet, mirror, and vanity light. Faucet sold separately. 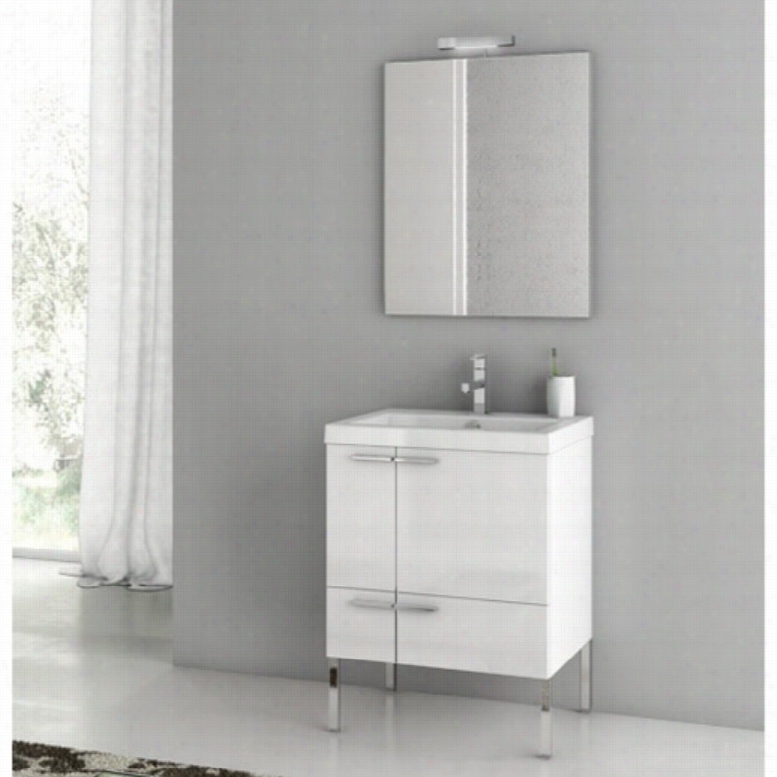 The vanity and short cabinet are wall mounted for a free-floating look and finished in Glossy White. Thick chromed pulls open the soft-close doors to reveal ample space inside. The mirror is topped with a sleek light for modern illumination. The chromed towel bar adds practicality.Component Dimensions:Vanity dimensions: 22W x 16.9D x 21.8H in.Short storage cabinet: 13.8W x 8.2D x 28.3H in.Fitted sink dimensions: 23.6W x 17.7D in.Mirror dimensions: 23.6W x 28.3H in.About NameeksFounded with the simple belief that the bath is the defining room of a household, Nameeks strives to design a bath that shines with unique and creative qualities. Distributing only the finest European bathroom fixtures, Nameeks is a leading designer, developer, and marketer of innovative home products. In cooperation with top European manufacturers, their choice of designs has become extremely diversified. Their experience in the plumbing industry spans 30 years, and is now distributing their products throughout the world today. Dedicated to providing new trends and innovative bathroom products they offer their customers with long-term value in every product they purchase. In search of excellence, Nameeks will always be interested in two things: the quality of each product and the service provided to each customer.